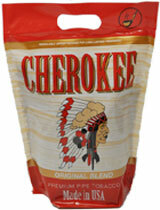 Cherokee Pipe Tobacco offers smokers the perfect concoction of finest burley leaves and flue-cured tobaccos. Made in USA, Cherokee hails from the Native American culture, and grown by American Indians on Indian reservation, where they select tobacco leaves carefully. It has a full-bodied flavor and a delightful aroma offering a pleasant smell. 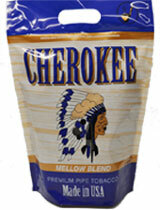 Cherokee pipe tobacco comes in 5 amazing flavors of menthol, mellow, original, ultra light and Turkish bold. Each of these flavors are created to satisfy a wide spectrum of tastes and preferences of avid smokers. If you're looking to purchase these amazing aromatic flavors of Cherokee Pipe Tobacco, pick out the flavor you like and have it delivered to your doorstep.